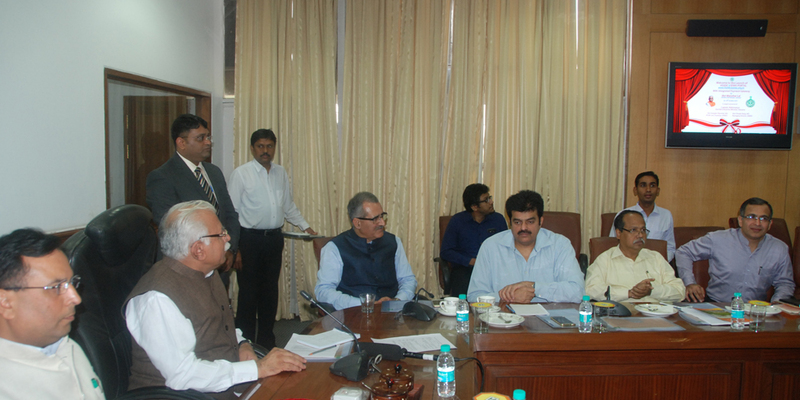 October 19, 2015- Haryana, India: On Friday, 16th of October, Haryana Chief Minister Manohar Lal Khattar launched the e-sewa portal for Haryana State Industrial and Infrastructure Development Corporation (HSIIDC). The Industries minister Capt. Abhimanyu was also present at the launch. Along with the portal, the chief minister also released the Estate Management Procedures-2015 for HSIIDC during this launch event. Himanshu Jain, Ritesh Patel, Vijai Gupta, Nandan Dixit, Ashish Srivastava from Silver Touch Technologies Limited, were present at the inaugural function. With this portal, the whole estate and C&H management for HSIIDC has been computerized, which will help the staff members, prospective entrepreneurs as well as allotees to apply and monitor the status of their application for the various purposes. Silver Touch Technologies Limited developed the e-sewa portal for HSIIDC https://www.hsiidcesewa.org.in . The solution proposes to automate the three different modules of HSIIDC namely finance, infrastructure and e-governance. The information for these modules will be stored at a centralized location, which will be accessible for all the HSIIDC applicants and staff members, thus offering convenience and transparency. This portal will streamline the whole process, thus offering the right information at the right time to the right people. With this portal, three processes namely pre-allotment, allotment and post-allotment are completed without any complexity or complication. “The prospective entrepreneurs can easily submit the applications after filling out their personal details, and details on the activities undertaken as well as the required project details using this portal. We have ensured that the entrepreneurs can make online payments using the integrated payment gateway. This gateway will allow you to make payments for the various services accessed from HSIIDC like plot cost, installments, maintenance charges, transfer fee etc.”, said Capt. Abhimanyu, Industries Minister Haryana. With this portal, the applicant can apply for online/offline application for the industrial as well as C&H plots. They can make the payment online, and create their own accounting. Using this account, the applicant can communicate with HSIIDC, track the application status etc. A personalized dashboard is offered to each applicant of this portal. Various activities have been guided through this portal. Allotment and post allotment process is also carried out through this portal. It is a one-stop shop for all land and plot allotments that occur in Haryana. HSIIDC is the public limited company that is owned by the Government of Haryana. It was incorporated in the year 1967 following the Companies Act 1956 procedures. The main idea behind creating this company was to develop the industrial infrastructure within Haryana keeping the guidelines of Department of Industries and Commerce, Haryana in mind. This institution is working towards industrial growth and economic progress with state-of-art infrastructure in Haryana. The main purpose of this institute is to offer a smooth start to the different organizations.